Greyton is a long way from the heart of the Cape winelands. It’s actually a long way from anywhere. 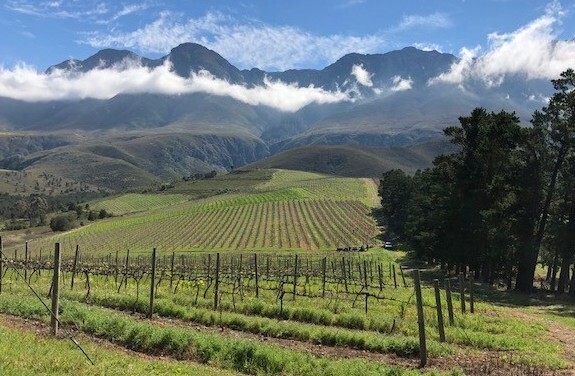 But it’s a famously delightful, arty little village set in beautiful mountainous surroundings – and ten kilometres or so out of town is a wine estate producing remarkably fine wines. I was reminded of all this last week when I made the trek from Cape Town on a lovely spring day through an Overberg resplendent with hilly vistas of young green wheat and brilliant yellow rapeseed. Destination Lismore Estate. 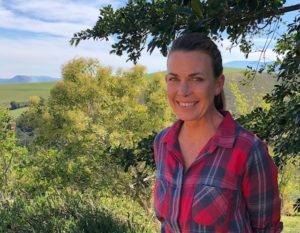 Winegrower Samantha O’Keefe is a little bored, I think, with her own story – or at least with telling it. It’s a remarkable one, though: A young Californian woman with no background in wine abandons a successful career and moves to what couldn’t more literally be the other side of the world (because she’s going to have children and is determined that they won’t be brought up in America; I daresay there’s a bit more to the push-and-pull factors involved, but that’s sufficient); in 2003 she buys a lovely farm with magnificent views near Greyton, starts planting vines, and makes wine in a space beneath the house that’s she’s had built there (later she did her vinifying in Elgin and then the Breedekloof!). She has two children, but the marriage doesn’t work. Nor for some time does her business, though she has already gained some reputation for her small-production wines. At one point, things are touch and go and she has to sell off part of the farm in order to survive a little longer. Then comes international success, following Neal Martin’s glowing reports of her wine for Robert Parker’s Wine Advocate in her native country. Things get better and better. Things are good. If that’s a ridiculously brief summary of the adventures, troubles and success of a clearly resilient, confident and talented person, you should hear her own short version: “I came to South Africa and now everything is fine…. I am a winemaker in South Africa.” Let’s leave the background story at that. I’m rather proud to believe that I was the first journalist to ever go out to Greyton to visit Samantha and Lismore (OK, that’s not such a great achievement in South Africa, where few wine journalists travel further than Stellenbosch, and then only when the lunch or launch isn’t brought to them or them to it.) Anyway, it’s quite a few years since I was last there, so it was a great pleasure to cross the mountains, take the dirt road out of Greyton and the bumpier one up to Samantha’s isolated house and vineyards. What is new? Samantha has perforce learnt viticulture as well as winemaking. She now has all four Northern Rhône varieties planted (syrah and viognier for quite some time, and younger plantings of marsanne and roussanne), as well as sauvignon blanc and chardonnay: all dryland-farmed and low-yielding in her shale soils and cool climate (the drought didn’t spare Lismore, by the way). And she has a proper winery of her own now, built in time for the 2017 vintage – spare and simple, but spacious and replete with barrels and tanks and eggs both plastic and cement. It’s clearly a source of great satisfaction to her, especially as she’s convinced that it has led to an “exponential growth in quality”. And so to the wines, enjoyed on her veranda with its splendid views across the Overberg. The views did no harm to my pleasure, but weren’t needed, for the wines are very good indeed. The overall aesthetic is one of restraint and elegance, the wines fresh and energetic. It comes as a surprise to me every time I really enjoy a sauvignon blanc or a viognier and think I could be happy to spend an evening with it. I could do that with her Age of Grace 2017 viognier from Elgin, rich, textured but with fine acid and charming aromatics well controlled by oxidative handling. And with the blackcurranty, pure-fruited Barrel Fermented Sauvignon Blanc, including some grapes from elsewhere, with its brilliant but unaggressive acidity. The wines entirely from grapes off Lismore’s extremely low-yielding vineyards now appear as Estate Reserves with a smart new look, including vintage neck-labels. And while I admired the lightly perfumed Lismore Syrah 2016 (my notes full of words like balance, restraint, fresh, textured), the maiden Estate Reserve Syrah 2017 adds greater complexity and depth. The Estate Reserve Chardonnay 2017 is also more complex, and richer, than the straight 2016 (with a Kaaimansgat component) – partly because of its new-oak component: a grander wine, but I understand Samantha’s slight feeling of loss of the pure, elegant understatedness of the old-oaked version. Her second red, a Pinot Noir from Walker Bay and Elgin (2017, the second vintage) has both perfumed charm and structure, bright and light-feeling – but I admire the syrahs more. Some 70% of Lismore wines are exported, carrying some of the beauty of the Overberg with them to other parts, but look out for them locally, and enjoy. Most of them are undoubtedly in the upper tiers of their categories. Samantha O’Keefe came to South Africa and now everything is fine.